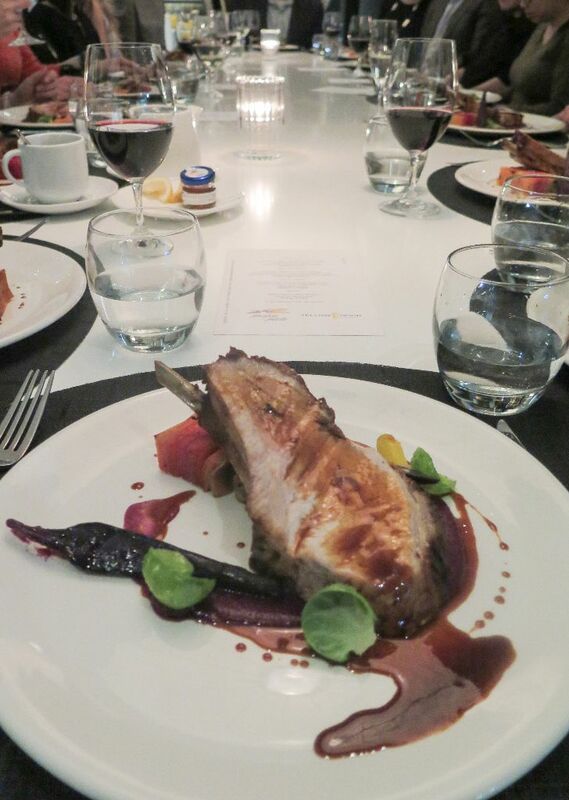 Last week, Chef Jan Hansen hosted the first Taste Alberta – Prairie on a Plate dinner in Calgary. Following three successful Prairie on a Plate events in Edmonton in 2016, the dining series travelled down the QEII where chef Hansen treated diners at the Hotel Arts‘ Yellow Door Bistro to four-course meal highlighting the best of what is grown, raised, and produced in Alberta. The whimsical decor of Yellow Door Bistro was the perfect background for a creative menu from executive chef Jan Hansen, chef de cuisine Quinn Staple, and the rest of the Yellow Door Bistro culinary team. The challenge put to chef Hansen was to highlight Taste Alberta partners including Alberta Milk, Alberta Pulse Growers, Alberta Chicken Producers, Alberta Turkey Producers, Egg Farmers of Alberta, Alberta Pork, and Alberta Canola Producers Commission. Chef Hansen started things off with a melt in your mouth amuse bouche – Sunworks Farm chicken liver parfait, seabuckthorn berry, and a Highwood Crossing rye cracker. My date for the evening – fellow Passion for Pork contributor Dan Clapson – captured this beautiful image of the dish. Next, a bowl of smoked Alberta lentil velvouté was poured table side over a bite of Honey Meadows Farm honey glazed Bear and the Flower pork belly and Highwood Crossing cold pressed flax seed oil. Chef Hansen smoked lentils, which he sourced from Grain Works farm in Vulcan Alberta, was my favourite dish of the night. For our main course, Chef Hansen served up a generous portion of Bear and The Flower roast pork loin. The dish was complimented with confit chicken, an ombre coloured root vegetable pavé, and a cabbage puree. I think chef Hansen was intrigued by the challenge I pose to chefs with Swine & Dine, because he kept the pork theme alive with our dessert course. To finish our Taste Alberta diner, Chef Hansen presented a rosemary creme brûlée topped with candied guanciale (cured Bear and The Flower pork jowl). While pork and dessert isn’t for everyone, I loved it. Chef Hansen shared the recipe, which patrons took home on a Taste Alberta recipe card – the sweet and savoury recipe is also available on Taste Alberta’s website. Chef Hansen proved that even in depth of winter, it was -30 that night, there is still an abundance of incredible made-in-Alberta products available for your palate to enjoy. I’d like to thank chef Hansen, general manager Michael Paddock, and Christie Goss, marketing & media relations manager with Hotel Arts, for hosting us at Yellow Door Bistro at what I hope will become the first of many Taste Alberta dinners in Calgary.